Canadian Thanksgiving is celebrated on the second Monday of October. This year it will be October 12th. American Thanksgiving takes place on the fourth Thursday of November – the 26th in 2009. [caption id="attachment_301" align="aligncenter" caption="With high percentages of colour change, and low leaf fall, this is peak time for fall colors (colours), especially on the maples."] [/caption] For something different this (Canadian) Thanksgiving, there are new mid-week and weekend deals available at Ontario resorts. "A resort provides a good base for a family get-together. You can put your feet up and let someone else do the cooking, or cook your own turkey in a glorious fall setting," says Grace Sammut, executive director at Resorts of Ontario. With over one hundred members, Resorts of Ontario is the province's largest resort association. 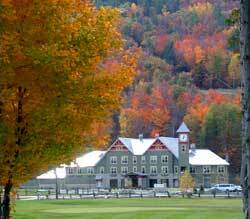 Properties are categorized into four groups: resort hotels, resort lodges, cottage resorts and country inns. Some offer accommodation with fully equipped kitchens while others are American Plan or Modified American Plan and include meals in their pricing. Prices range, and so do the amenities. On the website, you can search for resorts across Ontario by experience, season or region. Advanced search allows visitors to search sub regions too, such as the Algonquin Park area. Links to individual member resort sites make it easy to compare packages and amenities. 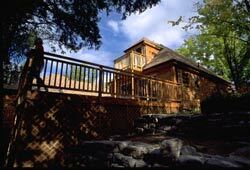 Here is a sample of new Thanksgiving deals in each resort category: [caption id="attachment_302" align="alignright" caption="Dickson Manor at Calabogie Peaks Resort"] [/caption] Resort hotel: Calabogie Peaks, fifty minutes southwest of Ottawa, has a deal for couples this Thanksgiving. Its two-night (Sunday & Monday) "Lovers" package includes standard room accommodation, continental breakfast both mornings, three-course dinner for two on one night and a welcome wine with cheese platter. Priced at $380.55 double occupancy, taxes included. Calabogie Peaks has chairlift rides to view the spectacular fall colors. [caption id="attachment_306" align="alignright" caption="One of the cottages at the Irwin Inn"] [/caption] Resort lodge: The Irwin Inn on Stoney Lake just north of Peterborough has a Thanksgiving deal for young families (two adults, two children under 10 yrs). Two nights (Saturday & Sunday) with breakfasts and dinners, including a Thanksgiving feast on the Sunday night, Thanksgiving hayride, and use of all seasonal facilities. $275 per adult, double occupancy, taxes and gratuities extra. The two kids stay for free. 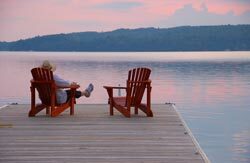 [caption id="attachment_308" align="alignright" caption="The dock at Foxwood Resort"] [/caption] Cottage resort: Foxwood Resort is on Lake of Bays in Muskoka, not far from Algonquin Park. Book three days over Thanksgiving and save 15% off regular daily rates. A three-day weekend package ranges from $385 for a one-bedroom cottage to $930 for a four-bedroom cottage. Fully equipped kitchens allow you to cook your own Thanksgiving dinner. 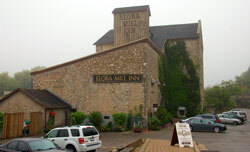 [caption id="attachment_310" align="alignright" caption="The Elora Mill Inn"] [/caption] Country Inn: The Elora Mill is an hour northwest of Toronto, close to the Elora Gorge. Its "Two Can Dine" dinner package includes a three-course a-la-carte dinner for two in the award-winning H20 Restaurant, accommodation in a historic guestroom and a country breakfast for two. From $163 per person, per night, based on double occupancy. Taxes and gratuities are extra. 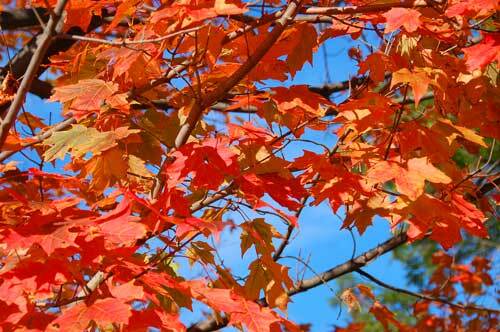 Check out the Fall Colour Report put out by Ontario Parks. Happy Thanksgiving.